JSC „Skandeka“ is a stable and successful transport and logistics company. 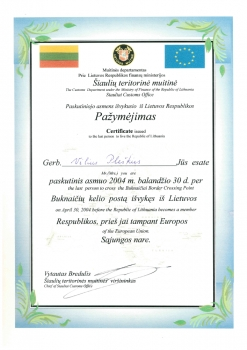 We are members of Lithuanian National Carriers Association LINAVA since we were established in 2001. 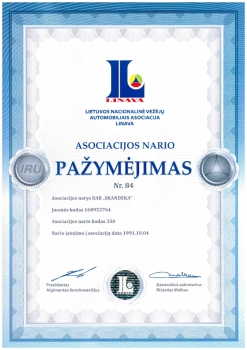 Since the launch of our freight forwarding service in 2015, we became members of Lithuanian National Association of Forwarders and Logistics LINEKA. Our focus is the delivery of groupage and one-piece cargoes from the Norway, Sweden and Finland to Lithuania, Latvia, Estonia, but we are expanding our business to cover more countries. We deliver part (PTL) and full truck load (FTL) shipments and dangerous cargoes (ADR). Our fleet includes tent trailers (82-92m³ of volume), road-trains (120m³ of volume) and refrigerated trailers. All freights are insured with enhanced CMR insurance – 16 SDR per kilo. Our goal is to be the leaders in the market and deliver highest quality of service for the best price. 80% of our fleet are trucks and trailers made in 2012 and newer and all are equipped with GPS and GSM system. This, coupled together with our own vehicle park, skilled and flexible employees and many years of experience in the industry, enables us to offer a high quality of service for reasonable prices. Due to our experience in the field, we can guarantee professionalism, accountability and reliability for every single booking. We believe that the bitterness of poor quality remains long after the sweetness of low price is forgotten. 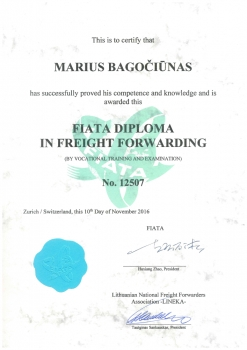 Our vision is to be one of the most advanced international logistics and freight forwarding companies in Lithuania.